The Study Commission Recommended That Our Kids Be Stuck Testing Into Eternity: Now What? Yesterday, New Jersey Governor Chris Christie’s Study Commission on the Use of Student Assessments in New Jersey issued its long-awaited final report. To the surprise of no one, the Governor’s minions Commission concluded that the PARCC test is wonderful, and that not only should New Jersey keep using it, we should require all high school students to take it to qualify to graduate starting with the Class of 2020, and require them to earn passing scores on the 10th grade English and Algebra I tests starting with the Class of 2021. My older daughter is in the Class of 2023 (and my younger daughter is in the Class of 2027), so this has a direct impact on my family and me. For the record, this year 36% of NJ students who took the 10th grade English Language Arts test receiving scores demonstrating that they met or exceeded expectations, and again, 36% of Algebra I test takers received scores reflecting that they’d met or exceeded expectations. Over a hundred people came out to the 3 public comment sessions. All but maybe ONE of them spoke against PARCC testing in NJ. Parents and educators everywhere — from teachers to my daughter’s recently retired building principal to our town’s superintendent — are opposed to this sham of a test. But the pre-determined outcome is in fact the actual outcome. Public comment had no impact whatsoever. The game is rigged, and it’s our children who are losing. But this outcome can be laid solidly at Chris Christie’s door, and the national media should hold him accountable for it. After all: he appointed the “independent” study commission; he appointed New Jersey Education Commissioner David Hespe; and he appoints all of the members of the New Jersey State Board of Education. So the buck stops with Christie. But on a structural level, the fact that ALL public education policy makers are ultimately accountable to one person demonstrates how broken and easily manipulated our state education policy truly is. We the Parents, We the Taxpayers, and We the People need to step in. It is time to demand change — an amendment to the NJ state constitution, if necessary, to get elected representation on the State Board of Education. Rule making bodies like NJSBOE and NJDOE have tremendous power to interpret state education statutes however they see fit. They must be accountable to the people and not just to a governor dreaming of the White House. In NJ, our local school boards have abdicated policy making responsibility saying that they’re hamstrung by state mandates. And those state mandates come from entities that are all accountable only to our governor. Structural change is necessary if we want to preserve public education for our children and the future. Wednesday night I plan to attend my local district’s Board of Education meeting. For me, at least, the hot topic will be school tours, which are a big deal for parents of incoming kindergarteners and incoming middle schoolers in our all-magnet suburban school system. Last weekend, a local micro-news blog created a brouhaha when it reported a scuffle between the district PTA council president and the superintendent over whether the district had decided to replace school tours with online videos. For a whole lot of reasons, I think school tours are important, so Wednesday night I plan to attend our local Board of Education’s next meeting to express my opinion during public comment. Why does this matter? What is unusual about this vignette is how rare it is for our local Board of Education to actually have the authority to set policy about a school-related issue, so for once my comment might actually make a difference. The only reason our local board has sole authority over this issue is that this is such a unique local issue that Trenton has not bothered to dictate tour procedures to our town. But on virtually every other topic these days, most New Jersey education policy decisions emanate from Trenton, where the New Jersey Department of Education and the New Jersey State Board of Education issue implementing regulations for state education statutes, and issue policy guidance and bulletins to New Jersey school districts. Although the local tide has turned and our local BOE seems slightly more independent now, for the past few years, our local school board interpreted this pledge as requiring it to slavishly follow Trenton’s mandates, regardless of whether the local board of education thought that such mandates might be harming our children. Whether deliberately or not, they seemed to ignore the second sentence of that pledge, and nobody but nobody was willing to utter a peep against Trenton. Especially given that the Christie administration decided to ignore the legislatively enacted state aid funding formula (“SFRA”), I think they were all terrified to open their mouths and bring the wrath of Trenton down upon them in dollars of aid magically not allotted to our district. So for the first couple of years in which I attended local Board of Education meetings, when the public spoke out – and speak out it did – about the harm that many of these state mandates were doing to children, our local BOE copped out by saying that these were decisions made in Trenton, and its hands were tied. I urged it to take action to influence and change state policy, but was largely ignored, presumably as a naive gadfly, which I undoubtedly am. From my talks with friends, colleagues, and fellow activists throughout the state, my understanding is that Montclair’s school board was far from alone in taking this position. This 2001 Code of Ethics for School Board Members seems to have served to hamstring many local school boards, depriving them of local control on any and all topics on which the State Board of Education and/or the New Jersey Department of Education have decided to opine. The ethics rule, which sounds reasonable on the surface, has functioned to make our school boards little more than powerless rubber stamps for whatever state policies the NJDOE and the NJ State Board of Education decide to impose on New Jersey’s public school children. What this tells us is that by now, given that we are in the seventh year of Governor Christie’s tenure, all of the New Jersey State Board of Education members were appointed, re-appointed or allowed to continue in office by Gov. Christie, and are beholden to him – and only to him – for their positions. So again – who is responsible for appointing not just the members of the State Board of Education, but also the Commissioner of the Board of Education? Chris Christie’s State Board of Education, subject to the governor’s approval, of course. In fact, Dave Hespe can be removed by Chris Christie whenever Christie feels like it, so long as he gives his buddy Dave notice of his removal and an opportunity to plead his case first. The long and the short of it is – New Jersey’s governor has a LOT of power over state education policy, especially since the 2001 local school board code of ethics hamstrung any local Board of Ed members who wanted to push back hard against asinine state mandates. I have no idea of the backstory that led to the 2001 ethics law, but I do find it curious that the timing coincides with the federal government centralizing some control over education policy through the 2001 No Child Left Behind law. Now, the legislature can, of course, override the State Board of Education by passing legislation abrogating Department guidance and/or Board-issued regulations. However, to do so, it must pass such legislation through both houses of the legislature and, of course, get those bills signed by… you guessed it… the Governor. And, of course, the implementing regulations for any such legislation passed by the legislature will be created and approved by… you guessed it… the State Board of Education. So any way you parse it, the NJ governor has enormous control over what happens in our public schools, and among other negatives to this lack of checks and balances is the fact that governors with different policy prescriptions can wildly swing education policy from one election to the next. Yesterday, as I mentioned at the top, the Governor’s “independent” Study Commission released its report on state testing in New Jersey, which concluded, unsurprisingly, despite around 200 in person or emailed public comments in opposition and virtually none in support, that the PARCC is super awesome. But, of course, it’s absurd on its face to think that a Study Commission appointed by the same governor who is responsible for appointing the State Board of Education and the State Commissioner of Education would reach a different conclusion than whatever the governor’s office (or his presidential campaign) wanted it to reach. All three of these entities are answerable only to Chris Christie, and as newspapers have reported throughout Governor Christie’s tenure, he is not hesitant to bully those who disagree with him into submission. And when those who disagree with him are people he thinks should be loyal to him, the gloves truly come off. was pre-ordained. Ironically, the Study Commission’s entire report would earn a big fat F under the Common Core Standards if it were graded according to PARCC scoring rubrics. The reason for this, of course, is that paragraphs like the one I just quoted cite to absolutely no evidence to support their conclusions. One of my takeaways from this sham of a process (and don’t even get me started on the Common Core Review Commission, which also issued recommendations yesterday, and which was, perhaps, even worse in terms of process, if that’s even possible) is that there is way too much power over education policy consolidated in the hands of one person in this state: our Governor. There is no question that Governor Christie’s minions appointees on the State Board of Education and at NJDOE will gleefully embrace the Study Commission recommendations, and that so long as this governor or a successor who shares his education policy prescriptions remains in office, the people will have little to no ability to shape more student-friendly education policy. (1) We need to amend the New Jersey State Constitution so that at least some of the members of the State Board of Education are elected officials, accountable directly to voters rather than to the Governor. The governor’s control over the rule making process is way too all-encompassing, and at least some elected State Board of Education members would provide needed checks and balances for educational policy making in New Jersey. Especially now, when the federal Every Student Succeeds Act (“ESEA reauthorization”; i.e., No Child Left Behind’s replacement) has moved a great deal of education policy making authority from the federal government back to the states, we need to ensure that state level education policy cannot be so easily held captive by special interest groups who’ve courted the governor, but no one else. Our kids deserve local leaders with the authority to actually put the children’s best interests first. As the Study Commision report hammers home, this administration can never be trusted to do that. New Jersey, let’s take our cue from New Jersey Education Commissioner and make a really good change to the New Jersey State Constitution. It is time for We the People to reclaim our power over our children’s futures, instead of leaving that power consolidated in the hands of the New Jersey governor, currently Chris Christie; the unelected New Jersey State Board of Education, each of whom owes his current tenure in the job to Chris Christie; and Christie appointee, New Jersey Education Commission David Hespe. The quote is absolutely on target. Further, let’s talk about the logical results of how even a properly functioning (according to the charter cheerleaders) all-charter school district would work. By definition, a charter school is one that is intended to trade results for regulation: that is, We the Public eschew traditional regulation over watching how our public dollars are spent by the charter (which is governed by a private board, usually impervious to OPRA/FOIA requests and the like) in exchange for producing “results” — i.e., high scores on standardized tests from its students. If a particular charter school isn’t producing results by the end of its initial charter period, in theory the state and/or the chartering entity should be shutting that school down. But the logical conclusion of that paradigm is a two-tiered system of charter schools. The so-called “high-performing charter schools” (e.g., the KIPPs, the Uncommon Schools, the Success Academies, the Green Dots, etc.) will figure out the formula for magically skimming-off as many of the high-performing kids as possible, and so their test scores will reflect the “results” the charter authorizers demand. But the rest of the charter schools, the B-squad charter schools of virtual charters, for-profits, mom and pop charters, less savvy charters, etc. — they are far less likely to have figured out, or, if they’re ethically run, to have wanted to figure out, the secret-sauce for creaming off those most likely to perform well on the standardized tests and quickly counseling out the rest. And so, instead, if the all-charter system functions as it is supposed to, after 3 years or 5 years or whatever, the B-squad charters schools will be shut down. But what happens to the children who attended those B-squad now-shut-down charter schools, and/or those who are pushed out of the high-performing charters? Well, their educations are disrupted, over and over again, as they are shuffled from low-performing school to low-performing school. Their former schools shut their doors, over and over again. But new low-performing charter schools will continue to open in the wake of those that keeping closing: after all, until they drop out, the students of the low-performing charter schools need to be housed somewhere. For those relegated to the low-performing charter network, their chances to build communities around their schools are low, as even their schools are transient: heck, even if they do manage to graduate, many of their alumni won’t even have a school in which to hold a reunion ten or twenty years from now, because the iterations of the schools they attended will no longer exist. And that disruption, that lack of community, that being shunted around from low-performing school to low-performing school, that will make them less likely to graduate, less likely to be able to overcome the already-substantial long odds that accidents of demographics, the dark side of poverty, have placed in their way. As evidenced by this article, an all-charter school system is a way to write-off our most challenging children, the ones that each and every one of us should look at and say that as citizens of this country, it is truly our moral responsibility to make sure that these children have every opportunity we can give them to break the cycle of poverty, because the American Dream is truly dead if a significant subset of our community has no way to succeed. But the way to keep the American Dream alive is to ensure that We the People provide our most vulnerable children with opportunities to attend well-resourced, integrated, stable schools that won’t disappear on them, sometimes mid-school year. It is not to keep pulling the educational rug out from under these children, every two, three, or five years. But the charter cheerleaders, they say that closing down the low-performing charters, that’s evidence of success, because closing down low-performing charters is how the charter system is supposed to work: that’s how you hold the poorly performing schools accountable, by shutting their doors when they don’t perform. The charter cheerleaders, however, don’t realize, if they’re naive, and don’t care, if they’re cynical, that closing down one low-performing charter means opening another one in its place. After all, the low-performing students of the low-performing charters are those who aren’t savvy enough to game and navigate the incredibly complicated systems privatization brings. Instead, intentionally or not, they are shunted around from one substandard education experience to another until they simply give up and drop out, or, if they do graduate, graduate with substandard skills and substandard opportunities. The narrative that shutting down low-performing schools works is a narrative that is either incredibly naive or incredibly cynical. What that narrative isn’t, however, is a narrative that serves kids — all of our kids — well. That narrative is, however, as Michael Petrilli over at The Thomas B. Fordham Institute implicitly admitted last winter, a narrative that distinguishes between our country’s deserving students, the deserving poor, and the un-deserving poor, who, at best, deserve, according to Petrilli and his allies, to be housed in a substandard world of alternative schools until they are eventually released from the system, likely into also-privatized prisons. Petrilli’s vision is one that reflects the worst values of the Industrial Age we thought we had left behind, the “Hard Times” of a Dickensian dystopia in which some children are stuffed full of “facts, facts, facts, nothing but facts, ma’am,” and slated for success, and the others, well, the others simply aren’t our concern. All of our children deserve better than this. All of our children deserve access to stable, caring, well-resourced, community schools that aren’t going to disappear on them at the whim of some bureaucrat, whether or not they “perform” on the asinine boondoggles that are today’s high-stakes standardized tests. I, for one, say no thank you to the logical consequences of an all-charter school system, as any moral citizen of this country should agree. That isn’t to say that our truly public school systems can’t do better. Certainly, in many of our communities they can and should (especially if We the People actually provide them with the resources they need in an equitable fashion). But the answers to the real problems of poverty and deprivation are not privatization and prison. Or, to put it another way, publicly-funded education shouldn’t be a real-life version of reality tv in which those who are savvier win the immunity challenges, and the less-savvy are voted off the island. Friends, fellow activists, especially my fellow Jews, this post is to bring your attention to what has been happening in East Ramapo, NY (Rockland County) for the past number of years, as the Haredi community has taken over the local school board, and systematically deprived the public school students of the East Ramapo School District, most of whom are poor and minority, of even a remotely acceptable public education. For background on the issue, please read this New York Magazine article, or listen to this episode of This American Life. You can find many resources on the issues, as well as a CALL TO ACTION at http://www.strongeastramapo.org. Recently, Meryl Tisch (NY Regents) and David Sciarra (Education Law Center) joined the call for the New York Legislature to pass a bill establishing state monitoring of the East Ramapo district to put an end to these abuses with an Op-Ed in The New York Times. The East Ramapo school board has accused its critics of anti-Semitism, which is part of why I think it’s particularly important for the Jewish community to speak out against its abuses of the gentile students who attend its public schools. Rabbi Jeffrey Salkin made a strong start with his piece and Rabbi Ari Hart with his. Specifically, at the moment the major issue is the bill that just passed the NY Assembly today to establish long-term state monitoring over the East Ramapo school district. The NY Senate is being resistant to posting this bill for a vote, and the legislative session comes to an end this coming WEDNESDAY, JUNE 17TH. Today I spoke with Rabbi Adam Baldachin of Rockland Clergy for Social Justice. They are in all-hands-on-deck mode looking for all of the media coverage and additional support from civil rights groups, Jewish groups, and any other groups that will sign on in support of this bill. Please consider lending your support to this bill, and to stand up for American and Jewish values even when it is some of our fellow Jews who are doing the oppressing. We must make sure that our own house is in order, and as Rabbi Salkin states, what is happening in East Ramapo is a shonda. Thank you for standing up for this community. This is why we are a democratic republic. We need checks and balances to make sure that a local majority — of any race, religion, ethnicity, or creed — does not trample on the rights of the minorities in its midst. As an education activist, as a Jew, as an American, and as a human being, I thank you for your support. Today, I was part of a full house at the New Jersey Senate Education Committee as it considered bills and a resolution relating to the PARCC (Partnership for Assessment of Readiness for College and Career) tests. Along with many other grassroots parent activists, I am frustrated by the Senate Committee Chair’s unwillingness to set down all of the much stronger PARCC bills passed by the New Jersey State Assembly for a vote in her committee. Rather, only one of the four bills, prohibiting PARCC-style testing for grades K-2, was set down for a vote by her Committee. Senator Ruiz also offered a substantially watered down replacement bill for the Assembly bill to notify parents of standardized testing. Senator Ruiz’s version of the bill, for example, fails to require that parents be notified of information as basic as what use local districts will make of standardized tests administered to their children (e.g., will the tests factor into student placement into gifted and talent programs or remedial education, etc.). So instead, I focused my efforts on the two bills introduced by my terrific local state senator, Senator Nia Gill. Senator Gill introduced two bills: one to require local districts to publish their PARCC opt-out numbers within 10 days of completing test administration, and the other to explicitly prohibit New Jersey Education Commissioner David Hespe from withholding state aid from districts with high PARCC refusal rates. The text of my full testimony is below. In it, I address the elephant in the room: the use of standardized test scores as a proxy to encourage resegregation of school districts by class and, to the extent that class and race are unfortunately still correlated in this country, race. My name is Sarah Blaine. I am here today to in particular support Senator Nia Gill’s bills, S2884 and S2881. No one is paying me to be here today: in fact, I took a day off work to attend this hearing. I have two children, a kindergartener and a fourth grader, in the Montclair Public Schools. Both of them only get one shot at their educations. When I saw changes in my older daughter’s curriculum as a result of Common Core, I sat down to read the standards. I’m an attorney now, but before law school I taught high school English. Given that I would have loved some standards (or, heck, books) as a new teacher in a rural community with few resources, I started out on the assumption that national standards were probably a good idea. But then I watched what was happening in my daughter’s classroom change. As PARCC loomed, homework became more test-prep focused, with multiple choice questions and written paragraphs that had to follow strict formulas. I learned that my older daughter’s school had reduced the number of elective periods. Social studies education virtually disappeared. Science became reading the textbook and filling in blanks, instead of labs and hands on experimentation. My 4th grader has not had a single field trip this year — and as far as I know, none are scheduled. I realized that I was seeing a predictable result of high-stakes testing in action: my daughter’s school was narrowing the curriculum to increase the time available for test prep. In Montclair, as across the country, test scores are closely correlated with the socio-economics of the populations tested. Although Montclair is consistently characterized in the press as “affluent,” according to NJDOE statistics, over 20% of our total school population is economically disadvantaged. Montclair has two NCLB focus schools not because those schools are lousy — they’re not — but because we are one of the few NJ towns with an economically and racially diverse enough school population to demonstrate an achievement gap. This has driven an increased emphasis on test prep, which benefits no one. Last December my spunky 4th grader testified directly to our Board about why “PARCC stinks” based on how test-prep was taking over her classroom. I can tell you this much: after that speech, which went viral and led to her live appearance on national television, I have no doubt, without any need for PARCC results, that when the time comes my child will be college and career ready. Of course, I already knew that: her parents’ advanced degrees, race, and socio-economic status make that a virtual certainty. If you policymakers want more children to succeed, you need to spend your time implementing equitable economic and housing policies to ensure that all citizens have the chance to join a robust and secure middle class. The Montclair Public Schools administration worked hard to implement — and, indeed, cheerlead for — PARCC. However, locally I wasn’t alone in my concerns about the effect that PARCC was having on our schools: more than 42% of Montclair children refused PARCC. However, we Montclair taxpayers were not even able to obtain that statistic from the school district without a fight. That is why I support Senator Gill’s bill to ensure that taxpayers are afforded access to the testing numbers. Recently, Education Commissioner Hespe — and Governor Christie — began explicitly threatening to withhold state funding from school districts with high PARCC refusal rates. That threat is unacceptable, as the school district has no way to compel me or any other parent to allow our children to sit for these tests. To be clear, I don’t say no because my child is anxious or scared. Rather, I say no to PARCC because I see, as a parent, the destructive effect that annual testing and high-stakes uses of annual results are having on the quality of education offered in our state’s traditionally high-quality public schools. I see that aggregate test scores are used — be it by real estate agents or home buyers — as proxies for socio-economic status, with the effect of further re-segregating our communities. I see it, and I get it, because I, too, looked at those test scores and school rankings when we were choosing the New Jersey community in which we wanted to raise our children. But then I realized that I didn’t want my children growing up in the same narrow bubble that characterized my childhood in Short Hills — and instead of moving to the town with the highest test scores, we moved to Montclair. If more New Jersey towns were integrated like Montclair, all of our children would learn a little more compassion, a little more wisdom, a little more humility, a little more sense of what’s possible, a little less fear of those not like them, and a little more awareness of how the accidents of birth can and do affect children’s futures. But politically, that will never fly, so you continue to test children and communities into submission, instead of choosing the tough — and admittedly expensive — policies that might actually work. Then, when parents like me say no, Commissioner Hespe tries to threaten us into submission. And so I support Senator Gill’s bill to prevent Commissioner Hespe from withholding funds from districts like Montclair, where the parents have had the courage to say no to the destructive effects of high-stakes annual tests. I ask you to support these bills because democracy cannot function effectively if it is predicated on failure to inform the citizenry of what is happening in our public schools. I ask you to support these bills because democracy cannot function effectively if it is predicated on empty threats from state-level bureaucrats meant to intimidate parents and communities. Our children deserve better. Thank you. I live in Montclair, an affluent town in New Jersey, and I opted my children out of the PARCC. In other words, if the numbers are to be believed, I’m a wealthy white liberal hypocrite. I spout platitudes about racial inequality while opposing reforms that would help children of color. Apparently I and my fellow black-and-brown opt-outers are in denial about how badly these awful Montclair schools are failing our kids. Who knew? Certainly not me. I thought Montclair was full of black people. Active, vocal, black people. Brown people too. I thought I was black. So did my children, who had no idea they are white—or rich (yay!). But these are the facts about New Jersey, according to the reformers: only wealthy white liberals are opting out of PARCC. The reformers should have notified the large multiracial group of opting-out students who crowded into Montclair school auditoriums during PARCC testing that opting-out is a whites-only privilege. They should have informed the protesting black and brown students who took over the Newark schools superintendent’s office that they are the wrong color. They should take aside those outspoken black parents at the Newark Board of Education meetings and minority anti-reform groups like the New York City Coalition for Educational Justice, and let them know: these are not the actions of black people. Stay in your lane, already. Yes, it’s true that majority-black-and-brown districts in NJ are less likely than well-off districts to have students who oppose PARCC and other reforms. Camden, a high-poverty, majority-black city, is an example. There the state has hijacked the school system and children of color are being forced into charter schools. Groups like Save Camden Schools are fighting back, but it looks like a losing battle. Silly me, I thought that was due to class, and social capital: you know, the fact that educated, well-connected families of any color are more likely to be able to challenge the reform mandates and not be punished for it precisely because of their intimate knowledge of how the system works. The more educated professionals in a town, the better able its residents are to challenge the corporate raiding of their schools. Negative repercussions are far less likely: if their kids don’t take the PARCC, so what? Professionals who know the system know their kids will still graduate from high school, still get into college. Not so with poor families in poor districts. Reforms are presented to them as the gateway to a good education and the social mobility that comes with it. Even if those families don’t buy the reform mantra, what choice do they have? Poor families don’t control their own schools. The reformers understand this, and care. The compassion they exhibit for poor minority families is touching. From Newark to Trenton, poor children of color are the focus of philanthropic millionaires and billionaires rushing into NJ to help them faster than you can say “Pass Go and collect $200!” Reformers constantly raise the specter of the achievement gap as justification for pushing more standardized testing. They argue that black and brown kids are the chief beneficiaries of all these reforms. Precisely how our kids benefit is unclear when their school curriculum is narrowed to focus on test prep, their test scores are used to tell them they’re ignorant, and their teachers are under threat of being fired. But the reformers have done their homework and know what’s best. Of course none of this has anything to do with the fact that there’s lots of money to be made in reforming the schools. Or that the pesky teacher’s union is getting in the way of profits. And, unlike the opt-outers, the reformers are a multiracial bunch. If you have any doubts about that, there are all those ubiquitous reform images featuring black kids or concerned brown parents to remind you. The education reform movement surely represents the face of multicultural America. Yet, somehow, even with all the black-and-brown faces fronting the movement, I sometimes wonder if it’s just corporate America seeing dollar signs in the education crisis facing poor black-and-brown children. I’m happy to report, however, that any doubts I’ve had on who’s pushing Montclair’s reform agenda were put to rest when I heard about the two corporate lawyers—both African-American—hired by a group of local parents to advocate on behalf of Montclair’s children. These concerned parents (who remain anonymous out of fear of “retribution”) are paying these lawyers to get rid of an African-American town council member on the Montclair Board of School Estimate with links to the teacher’s union. The lawyers are also filing a public records request to check the emails of Montclair’s African-American mayor for evidence of complicity with the anti-reform activists. So I shouldn’t have doubted. It’s a simple equation after all. On the reform side, concerned and fearful parents looking out for the best interests of disadvantaged minority children. On the anti-reform side, limousine liberal hypocrites and sinister union operatives. But still. I can’t help but wonder. The possibility that wealthy white people hired expensive lawyers to sue local black leaders would be pretty bad press for the reform movement. It might look like rich white folks are having a hissy fit because they haven’t gotten their way with our schools. It might look like—dare I say it?—hypocrisy. It would certainly be bad optics. Of course that isn’t the case here in progressive Montclair. Sometimes the devil gets in me and I’m tempted to suggest that perhaps, just perhaps, there may be a grain of truth in that offensive idea. But that would be a black lie, now wouldn’t it? The letter below is by Dr. Colleen Daly Martinez. Dr. Martinez holds a Ph.D in Social Work from Rutgers University. I first encountered her as a fellow local education advocate working to support our public schools; in the months since, we have become friends. She wrote this letter to Senator Teresa Ruiz, Chair of the New Jersey Senate’s Education Committee, and copied it to the members of the Senate Education Committee along with other local, state, and federal lawmakers, as noted below. Thank you to Georgette Gilmore for pointing out via Twitter that this needed to be clarified. The original letter as sent by Dr. Martinez to Senator Ruiz, et al. remains below. I have written to you before to express my concern about education reform and its impact on our NJ public schools, but I feel compelled to reach out again after listening to Education Commissioner Hespe’s testimony to you on Thursday, March 12. I will start by telling you about who I am, so that you understand my perspective and experience. I’ll then share with you my observations of the impact of education reform, and then close with some recommendations and requests. I am happy to meet with you at any time and venue to further this discussion, and I appreciate your time, service, and representation. I am a NJ Licensed Clinical Social Worker and I hold a PhD in Social Work which I earned at Rutgers University. I have more than 20 years of clinical social work experience with children and their families. I have worked with upper and middle class families, as well as with very poor urban and rural families in four counties across Northern New Jersey. I teach Master’s Degree students at a Research I University, and I maintain a private practice where I provide consultation and supervision to mental health professionals. I also provide related services to special education students in a poor urban school district. Working in classrooms on a regular basis, I see very clear signs that education reform is already harming our most vulnerable students. First, the Common Core State Standards set goals and timeframes for when children should achieve certain academic goals, and place responsibility on the classroom teacher for student achievement of these goals. Consider a first grade standard: “CCSS.ELA-Literacy.RL.1.5 Explain major differences between books that tell stories and books that give information, drawing on a wide reading of a range of text types.” In some first grade classrooms we have children with developmental and medical challenges and communication and learning disabilities. Some special education students in first grade are nonverbal, literally unable to speak their own names. Some are visually impaired and learning to use assistive devices to safely navigate their expanding world. Others have serious emotional and behavioral challenges which require the intervention and support of mental health professionals and behaviorists. However, the Common Core standards and new teacher evaluation requirements demand that teachers, regardless of who their students are and what challenges they bring with them, prioritize the standards. Whether a first grade teacher has a group of 25 well fed, well rested students with no significant learning challenges, or a teacher has a group of 30 students, all poor, some hungry, and some with serious behavioral or learning challenges, they must both be working on this goal for their students: “Explain major differences between books that tell stories and books that give information, drawing on a wide reading of a range of text type.” Not only must both teachers be working toward this goal with their students, but their job performance evaluations will be based upon how well their students demonstrate mastery of this goal on the PARCC test. I hope that you can see why this system of ‘accountability’ is unjust. To make the assumption that children throughout the country, or even throughout New Jersey or Essex County, have the same educational opportunities, despite who they are and where they live, is absolutely false. What I have witnessed for the past four years is that what is now being referred to as “educational reform” is systematically causing harm to those who are most in need and most vulnerable. Many reformers say that a major problem with our educational system is that we don’t expect enough of poor children, or children with disabilities, and therefore these students underperform. Reformers’ rationale is that if we raise standards, and expect more from underperforming students, they will rise to the challenge. This assertion is missing a vital piece, however. The piece that is missing is WHY these students are underperforming. Researchers consistently find that having learning disabilities and living in poverty places more challenges on these children in their pursuit of academic achievement. What would be beneficial to helping these students achieve would be to provide resources where they are needed such as into specialized training for educators and special educators regarding working with students with disabilities; into school buildings to decrease class size; and into medical and social services to address some of the challenges that our students in poverty face. Raising academic standards when students already have challenges performing is similar to telling a wheelchair user that we are going to take away ramps and elevators, because they will be better off without them. This idea makes no sense. Reformers would have us think that children with very real challenges can somehow do better academically if we only believe that it is possible. This idea also makes no sense, in the absence of resources to help them achieve. Parents are now seeing that their children’s needs for remediation, review, reteaching, and focusing on foundational skills are being ignored because of the pressure to keep up with the standards. Teachers, whether in middle class districts with a classroom of regular education students, or in special education classrooms in poor districts, are accountable for variables that are out of their control. With the addition of PARCC testing as another measure of accountability for teachers and schools, developmentally delayed children are spending more time on computers than they are on social skills or on fine and gross motor skills. They thereby miss out on important developmental support which would eventually lead to healthier, well-balanced individuals. Reformers would say that the enhanced pressure on teachers is good for academic achievement. People who understand what is happening on the individual, classroom, building, and district level see that genuine, meaningful learning is being replaced by PARCC preparation. But this is true only in the poorest buildings and districts. More diverse, middle class, and upper middle class schools are largely spared because statistically and historically their students tend to do better on standardized tests. Subsequently, the ‘haves’ receive education to improve their lives, while the ‘have nots’ receive training to improve their PARCC scores. Over the long term, if these systems of holding teachers accountable for social inequity and student’s learning disabilities remain in place, I think we should expect a trend of highly-qualified and experienced teachers moving away from working in poor districts and away from special education. This, of course, will only cause more harm to students who are most in need. Commissioner Hespe would have us believe that PARCC results will be a learning tool. Instruction and remediation will be targeted to address specific areas where students are underperforming so that we can ensure that they are on the course toward being college and career ready. The problem with that justification for PARCC is that educators and administrators can already identify which students are in need of remediation. Class grades and GPA are indicators that are already readily available. Teachers, administrators and parents are excellent reporters of where students are falling behind and even failing. They can also be excellent reporters of where remediation is needed. However, remediation often cannot be provided because there aren’t sufficient resources to do so. Rather than spend huge amounts of money verifying what we already know, why not spend our resources meeting the needs of students and schools? The answer to that question is rather grim. Why do we put all of these tax dollars into an experimental assessment tool? Because there is tremendous opportunity to direct taxpayer dollars into the wallets of education reform companies. As Commissioner Hespe pointed out, it is impossible to compute the actual amount of dollars spent by each district on PARCC preparation, but we do know that NJ’s contract with Pearson alone is worth more than one hundred million dollars. Many informed educators postulate that when PARCC results do come back, Pearson will be ready to sell our districts remedial products. I want to further illustrate how some students are suffering more than others under these reform efforts. The students I work with in their school setting, some of whom have just turned three years old, are often English language learners. Most are eligible for free lunch. Their parents often are not able to read school notices that are sent home in English, and their parents often work more than one job to support their families. They usually do not have their own cars. Because of their parents’ work schedules, these students are often at school for before school care and after school care. Their school facilities often lack developmentally appropriate, safe recreation equipment. Therefore, some three year old children spend more than 9 hours a day at school, with little to no opportunity to run, tumble and climb. Optimistically assuming that these youngsters get the recommended 12 hours of sleep at night, their schedule might allow for three waking hours with their parents each day. I have no doubt that many of these families find it hard to provide enriching activities for their children’s growth and development during these three hours, and during whatever time they are not working on weekends. The school experiences of middle class children are often strikingly different. I’ll use my daughter as an example. Because her father and I have the benefit of relatively good jobs, our schedules allow for a parent to be home with her when she is not at school. Each morning I bring her to school at 9, and I pick her up again at 3:30. She has hours of time to do homework, play, and enjoy our company every evening. She has always lived in the same home, and has never had to go hungry, or worry about her own safety. She is lucky, in that her basic needs are met; that we have the time and resources to provide her with additional support at home to help her achieve the academic goals set forth in the Common Core standards; and that we can provide her with enriching activities to help her to be a happy, well-rounded person. Even with all of the benefits of her relatively comfortable life, her school experience has been stressful. Starting in kindergarten fours year ago, my daughter’s public school career has always been shaped by the Common Core standards. Despite being a typically developing child with no health or behavioral issues, she was flagged in kindergarten because she was not progressing adequately toward reading. For three years — until this school year — she was considered ‘below grade level’ in her reading ability. Thankfully, my husband and I are well-informed about child development and education, as well as about educational systems in other countries. We did not focus on her perceived ‘delay’ because we were aware that in many high-performing countries children are not even expected to begin developing reading skills until they are seven. We were also familiar with the research that points to the potential harm caused by pushing children to develop reading skills before they are developmentally ready. This harm includes feelings of inadequacy and an aversion to reading. I consider our daughter lucky that we have been able to spare her from the potential harm of the Common Core standards. The issue of resources is a primary reason why I am an advocate for our public schools and against PARCC. During this school year I have seen many schools, classrooms, and children suffer because of flawed use of resources. In a school in an urban district, a bathroom has caution tape up, surrounding a broken sink and loose floor tiles. The principal does not have the funds to have the bathroom fixed, and is dismayed because she was forced to spend $25,000 of her budget on Chrome Books in preparation for PARCC. In another school the teachers bring in their own bottles of hand soap for their students’ use, and there are no balls, jump ropes, chalk or other play materials in the parking lot (where children play because the gymnasium is also the cafeteria). Yet carts of laptops sit under lock and key in preparation for PARCC testing. 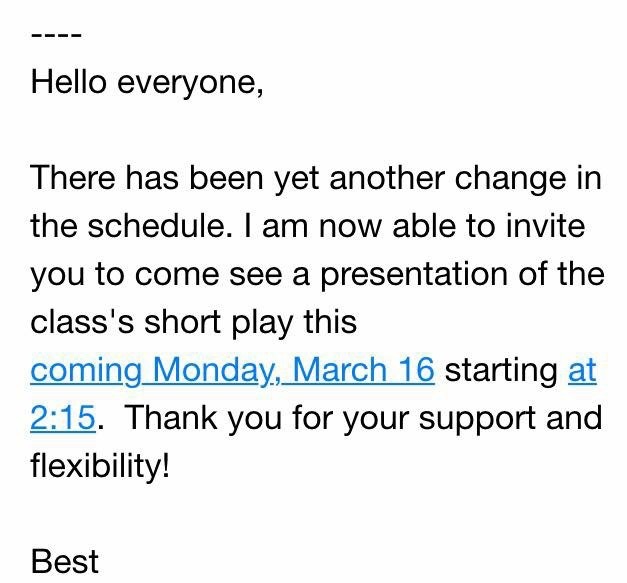 In my daughter’s school, theater productions are canceled, the library is closed for weeks on end, and substitute teachers are covering classes while teachers are proctoring the PARCC test. Unfunded state mandates have forced our schools to stop spending on what is needed, so they can meet the demands of the state. Our Montclair 2015-2016 budget proposal currently calls for increasing taxes, cutting more than 50 classroom level staff, and adding more spending for technology. This makes no sense! Commissioner Hespe testified to you that it would not be possible to compute the amount of money that districts have spent in preparing for PARCC. To me, that is quite concerning, but I believe that the worst waste of resources is the time that our students and teachers are spending in school this year NOT learning. My daughter’s class spent nine sessions this school year in the computer lab, learning how to use Pearson’s PARCC tools. They have taken numerous practice tests, not for the students’ benefit, but to check that the school’s internet and computer capacity could handle the actual PARCC administration. They have had countless days of being in class with substitute teachers who do not instruct, but simply supervise the students while their regular teachers have training to administer PARCC. The teachers have not been able to attend enriching and inspiring continuing education workshops because their professional development hours have been spent on PARCC preparation. Many educators would say, if asked, that the time and money that has been spent thus far on preparation for the PARCC test could absolutely have been put to better use addressing student needs that they were already aware of. Unfortunately, Commissioner Hespe and others that believe in this education reform movement would have you believe that educators have a problem with PARCC testing because they actually have a problem with accountability. Many test advocates say that teachers don’t like the test because it will show that their teaching is ineffective, and that PARCC puts pressure on teachers to perform given that PARCC scores will be tied to teachers’ performance evaluations. Advocates for public education, including educators and others who are familiar with educational research and practice say that it is unfair to hold teachers accountable for the reasons that students perform poorly since many of these include learning disabilities, poverty, and other issues that are beyond individual teachers’ control. If we truly want to improve academic outcomes, we need to put resources and accountability in the right places, and not into tools that will just continue to measure and accentuate the achievement gap. My biggest concern is about the long term impact on public education for poor children and children with special needs. Education reform executives, politicians, and education policy makers often send their children to private schools, where Common Core standards and high stakes testing are not used. Children who attend such private schools will continue to have the enriching educational experiences that they can afford. Our less privileged and more vulnerable students however, will suffer. Since PARCC’s focus is only on English language arts and math, and resources are scarce, many schools are cutting recreation, sports, science, music, drama, second language, and fine arts offerings. Students who struggle academically often find that these activities are the ones that make school fun, inspiring, and something to look forward to. We should also remember that not everyone is meant to be a business executive or a mathematician. As a society, we need people who are creative, inspired, out-of-the-box thinkers. By degrading the quality of our public schools and not offering equal opportunity for disadvantaged people, we will only enhance the achievement gap. Commissioner Hespe seemed determined to convince you in his testimony last week that the groundswell of opposition to PARCC is due to parents being uninformed. Please know that we parents are also professionals. We are business owners, corporate managers, teachers, artists, librarians, social workers, medical professionals, researchers, statisticians, and lawyers — as well as parents. We work our full-time jobs, care for our families, and have taken on our part-time roles as well informed social activists because we feel that our voices continue to be ignored and dismissed by those we have elected. Please allow our voices to be just as powerful as those alleging that they speak for us. As members of the Senate Education Committee, I know that you have our students’ and taxpayers’ best interests in mind. In addition to reading my letter, which I am so grateful that you have done, I am asking for your support. Please make a conscious effort to protect our public schools. Please make efforts to halt and roll back unfunded state mandates, including standards and expectations that set special needs students up to fail as well as the mandates that link test scores to teacher evaluations. Please make efforts to stop holding teachers accountable for variables that are not under their control. Please ensure that we, as parents, maintain our right to refuse participation in standardized testing for our children. Please work toward returning local control of schools to those taxpayers who are most invested in their success. Please do not allow the interests of corporate education reformers to be more important than the needs of our children. Please listen to parents, educators and administrators. Please put our public school students’ needs first. Again, I am thankful for the time that you have given to hear my concerns. Please do not hesitate to contact me at any time to continue this conversation. In a recent Facebook discussion about PARCC and the Common Core State Standards, I commented that the Common Core standards are developmentally inappropriate in the younger grades. Another participant in the discussion challenged that assertion, and pointed to the CCSS kindergarten literacy standards. He asked me to identify what was inappropriate in them. I think pointing to the Reading:Literacy Standards (Kindergarten) for an analysis of developmental inappropriateness misses the mark. My concern with the standards for the youngest grades is not with the Reading: Literacy Standards, which are about comprehension and understanding stories, but rather with the Reading: Foundational Standards (Kindergarten), which are about phonics and decoding words. The Reading: Foundational Standards require ALL kindergartners, for instance, to be reading CVC words (i.e., 3 letter short vowel words) by the end of kindergarten, unless those words end with r, x, or l. Requiring such phonics-based reading skills at that level by the end of kindergarten is developmentally inappropriate for many five year olds. I can tell you that from my own experience. I have two girls. Both have September birthdays. For a whole host of reasons, none of which I’m interested in debating here, we made the decision that we were fortunate enough to have the resources to make — we gave both of them an extra year of private preK. As a result, both started kindergarten just before they turned six, rather than just before they turned five. Both of my girls are bright, capable, and inquisitive. But they’re also very different kids, with different learning styles, interests, and developmental paths. As an aside, I can’t tell you how glad I am that I have two kids, because seeing how different my younger daughter’s path is from my older daughter’s is a constant reminder of how amazingly different two typically developing small humans from the same gene pool really can be. It’s remarkable to see — and a constant source of wonder for me. As I hope my regular readers might imagine, my house is full of books. We don’t have a family room, but in addition to our living room, we do have a dedicated library on the first floor of our house, and it was that library with its floor to ceiling built in bookshelves that made me fall in love with this house. But even the library doesn’t come close to holding our book collection. I’m not quite like my old friend Mel, of blessed memory, who, with his wife, had to move out of his four bedroom house to make room for the books it contained (he and his wife went to live in a small apartment nearby instead), but if it wasn’t for the Kindle, that path might have been part of my future. We’ve read to our kids regularly since they were in utero. Not surprisingly, our collection of children’s books has mushroomed. My oldest has four bookcases in her room, and my youngest can’t contain her books on the 3 bookcases in her room. I belong to a book club, I read regularly for pleasure (and let my kids see me doing so), my kids know that I taught high school English Language Arts, and it’s been clear to my kids for their whole lives that understanding life through literature is central to our family values. My oldest started asking me to teach her how to read shortly before her fourth birthday. Although my academic training was in teaching middle and high school, I was game to try. So I picked up a few resources, and we gave it a whirl. However, despite the fact that she already knew all of the letters and their sounds, it quickly became clear that she simply wasn’t ready, so we put formal reading instruction aside. I think we made another stab at it about three or four months later, but again, no dice. We tried it once or twice more, but each time the frustration for both of us outweighed any benefit, so we stopped. Then, in about March of her last year of preK (so she was five and a half at that point), it was like a switch turned on. Within about a week of her renewed request for reading instruction, she was suddenly reading, fluently, anything and everything she could get her hands on. She never looked back. By the time she entered kindergarten six months later, she was reading — with comprehension — a wide variety of texts, including simple chapter books. She’s continued to gobble up books — and to love reading — ever since. Obviously, meeting the kindergarten foundational standards would have been a no-brainer for my oldest. But remember, she had the gift of that “extra year,” so she started kindergarten weeks before her sixth — not her fifth — birthday. That was before our district’s Common Core implementation, but I’m not sure reading would have been so straightforward for her if she’d been forced to heavily drill phonics-based reading skills during what ended up (because of our choice) being her final year of pre-K. It’s clear to me from trying (at her request) to teach her that she simply wasn’t ready for phonics-based reading instruction at that time, but that’s when many kids — especially those who have fewer financial resources — enter kindergarten. My youngest is a kindergartener right now. Like her sister, she also has a September birthday, so she turned six shortly after school started in September. Unlike her sister, she didn’t start kindergarten reading — and there is no way she was ready developmentally a year ago, even though she met the kindergarten cut off back then (i.e., she could be in first grade now). Now, she is on track to meet the standard that requires reading CVC words by the end of the year, but that’s only because she was fortunate enough to start kindergarten just before her sixth birthday rather than just before her fifth. Many — probably most — kids in our country don’t have that luxury. My youngest, even more so than my oldest, is also a kid who gets really frustrated when asked to do a task she’s not yet developmentally ready to manage. Whether it’s academics or something else, when we’ve made the mistake of trying to push her to do something before she was developmentally ready, the result has been that she’s gotten really resistant to the task she’s not ready for, to the point that she ends up mastering it far later than I think she would have if we’d just left her alone. I am convinced that forcing my youngest to learn phonics to read a year ago — when she could have already been in kindergarten — would have been a nightmare. In fact, I tried briefly, remembering her sister’s experience, but it quickly became clear that forcing reading before she was ready was a terrible idea. To be honest, even the tiny (and quickly abandoned) attempt I made caused some reading resistance, which I think we’ve pretty much managed to undo at this point, but it’s taken a lot of patience to get there. Until now, my youngest just hadn’t hit the developmental switch required to read successfully. But that developmental switch — i.e., that point at which individual kids are ready for the abstraction necessary to be able to translate symbols on a page into the spoken language they’ve spent the last five years acquiring — it’s not something we can switch on earlier either by wishing or by imposing standards requiring it. Some kids are ready at four, some kids are ready at five, and some kids are ready at six. All of those ages are within the normal range for reading development — and despite taking some time to look, there’s nothing I’ve come across that indicates that an earlier reader’s long term outcomes will be better than those of a kid who learns to read later in the typical developmental range. This difference among children — as illustrated by my own girls — is precisely why a standard requiring real progress toward phonics-based reading in kindergarten is developmentally inappropriate. As I learned in my educational psychology and reading instruction classes, by sometime between their sixth and seventh birthdays, most kids have reached the developmental milestone that allows them to learn to read. At the moment, although it’s a slower process than with my older daughter, I can see that my six year old is getting there. For instance, she’s finally suggesting, at least once in awhile (to avoid housework, but that’s another story), that she try reading with me. But again, she’s a full year older than many other kindergartners. My youngest is bright and creative. In fact, I suspect that one of the reasons she’s relatively slow to read is because she can imagine alternate — and entertaining — realities for hours on end. That is, her imagination is so engaging that she doesn’t need authors’ stories to provide entertainment for her. As a result, reading — that is, the process of interacting with an author’s imagination — is less appealing for her, and so she’s less motivated to do it. My daughters’ different experiences with learning to read are why I believe that the Common Core Reading: Foundational Standards for Kindergarten, at least, are developmentally inappropriate. Forcing phonics-based reading on kindergartners as a standard they must all meet to be on the path toward college and career readiness is counterproductive because it’s developmentally inappropriate for many five year olds. If my younger daughter had started kindergarten a year ago, as she could have, I suspect that she would have been subjected to a cascade of interventions. Those interventions would not have occurred because she had a learning disability or any other problem that needed addressing. Rather, she would have been subjected to such interventions because the Reading: Foundational Standards for Kindergarten are simply inappropriate for many five year olds. The solution is to change the standards. Yet instead, their advocates often seem to be focused on interventions aimed at making all kids march in lockstep to a rhythm that fails to reflect the normal range of their developmental trajectories. It’s that insistence on lockstep, especially in the youngest grades, that frustrates me. Such insistence appears to mark the difference between endorsing a set of standards and advocating an ideology that allows no deviation from the party line. Our kids — especially our kindergartners — deserve better. P.S. I think this story also explains why the developmentally inappropriate expectations of the CCSS reading foundational standards are only going to widen, rather than narrow, the achievement gap. As noted above, the only reason that my little one will be able to meet the CCSS reading foundational standards by the end of kindergarten is going to be because she was privileged enough to have parents who could “red-shirt” her. It’s the fact that we could afford to choose to keep her in a high-quality play-based preschool for an extra year that’s going to allow her to meet CCSS for kindergarten. Not all families have that luxury: instead, the younger kindergarteners are going to be more likely to end up in repetitive, phonics and decoding focused response to intevention (“RTI”) or similar programs, which I think would have frustrated my little one further, and probably sent her even further down the path toward reading resistance. How many children living in poverty are going to end up in that boat, because the standards themselves set developmentally inappropriate expectations? 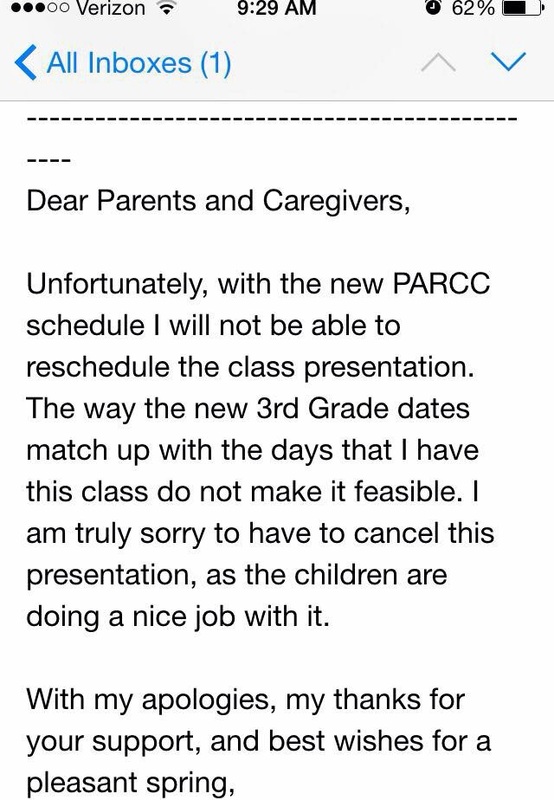 Dear PARCC, Can We Talk? This is the first in what I hope will be a series of regular contributions by guest bloggers on this site. This was written by Justin Escher Alpert, an attorney from Livingston, New Jersey. I’ve met Justin briefly a couple of times now, and I came across this piece in a Facebook group. I am sharing it here with his permission. The reason that you failed… the reason that parents across the country are rising up and organizing against your standardized test… it is not a matter of a bad roll-out… it is not a matter of bad PR. The reason that you failed is philosophical… Your standards did not account for real-world innovation. “A library has 126 books about trees. The library has 48 fewer books about rivers than about trees. Select from the drop-down menus to correctly complete the statement. library has about trees and rivers is [Choose…\/]. Now, let’s leave aside the fact that the poorly-worded second question does not necessarily give the test-taker enough information to answer. We know that standardized test scores correlate to the wealth and education of the parents of the test-taker. The children of wealthy, educated parents are more likely to have actually set foot in a local public library with adequate resources. For an urban child whose family may not know the value of an education, this standardized test question might merely be a hypothetical. I actually went down to the Newark Public Library and looked around and started asking some questions. They have signs up apologizing to their patrons that they have not had a budget to purchase new books for the past several years. Perhaps we should set new standards for libraries and assist them to have robust and current book collections that serve the intellectual needs of their communities so that we do not reduce the concept of public libraries to be mere hypothetical questions… but I digress. The Partnership for Assessment of Readiness for College and Careers has very narrowly defined excellence in a manner that corresponds to the wealth and education of the parents of the test-taker while we have missed our moral and constitutional obligations to adequately fund our urban public schools (and, apparently, our urban public libraries). With respect to the schools, private charter companies have stepped in and arbitraged the cost difference based on fulfilling this very narrow definition of excellence. PARCC has created a new set of “standards,” but there is little regard for real-world innovation. To gain a better understanding of what happens when innovation is only recognized from the top down, one need look no further than the students in Newark who are setting new standards for active, civic engagement by traipsing up and down the Mid-Atlantic to draw attention to real world problems with schedules, courses, teachers, desks, and edible lunches. The answers to your hypothetical PARCC questions have seemingly become more important than creatively solving the real-world problems as they present themselves (whether in the public library system or in the public school system or otherwise). When a child grows up in an educated and diverse community such as Livingston, New Jersey (with a warm, welcoming, and well-staffed modern library (with 51 non-fiction books about trees)), that child goes through a public school system that is accountable directly to the active and engaged parents in the community. The goal of the public school system is not to make our children “ready for college and careers.” We do not need a system to find the faults and shortcomings of our children. The goal of a public education is to create active and engaged members of the community. The goal is to create and empower citizens (like those brave kids in Newark) who can look at faults within systems and readily organize to correct them. The entire existence of PARCC Testing seemingly misses The Point. When a graduate receives a diploma from the Board of Education of a town like Livingston, New Jersey, that young adult will know her strengths and interests having been broadly exposed to this world, and will have the backing and respect of the community to make her voice heard. Your PARCC addition and subtraction problems about hypothetical library books is important, in your judgment. What if we felt that third-grade calculus were more important and we taught it during a model rocketry class? Or what if an impassioned and empowered physical education teacher felt that third-grade statistics were important and taught it through a rigorous spring Sabermetrics program where kids kept close track of their kickball stats? Or what if we felt that third-grade geometry were more important and we taught the Fibonacci sequence through a rigorous design and history program? By the way, it doesn’t take wealth to do any of this creative instruction. You can teach the mathematics of sound waves with two tin cans and a piece of string and really get kids excited about the process. Where does innovation come from? If the parents of the children who meet and exceed the PARCC standards wanted to change the PARCC test questions, could we? What if we wanted to switch from a testing-based model of education standards to an experience-based model? To whom would we need to speak? Is there a form we could fill out? The options are limitless, but impassioned and empowered professional educators are distracted because they have to return focus to YOUR standards, as limited by YOUR OWN imagination, on an absolutely brain-numbing computerized test that misses everything that was important about the student-teacher relationship. What should be the ratio of (i) the number of in-state higher education freshman seats to (ii) the number of in-state high school graduating seniors? If a state is interested in investing in itself, what should be its financial commitment to higher education tuition support? Perhaps, rather than PARCC assessing whether OUR children are “ready for college and careers,” you might help us set new standards for “colleges and careers” so that “colleges and careers” are actually ready for our (if I do say so myself) brilliant (but flawed… every last one of them… each in their own unique but lovable way) children when they graduate. Perhaps every job working for a major corporation or an institution of higher education should be available as a full-time position that pays a real living wage, because that would be important. Maybe, because we want our children to grow up to be responsible and engaged participants of their communities, we could limit those jobs to 40-hour work weeks so that those job holders are actually free at the end of the day to be responsible and engaged participants in their communities. Could you help us set new standards like that? When a child grows up in an educated and diverse community such as Livingston, New Jersey, that child is given the safe, judgment-free space to find his or her own place in society while learning through diverse experiences… with diverse teachers… across disciplines where there are no standardized questions, much less answers. Those opportunities need to be provided (and properly funded) for every child, regardless of the wealth and education of the parents. We might find that what is important is not that we can regurgitate standardized answers, but that we can push the very limits of our understanding as we learn and grow by proposing new questions and being empowered to collaboratively develop real-world working answers to those questions. Let’s definitively end standardized testing-based education. Let’s talk about moving in a new, experience-based direction that actually addresses and solves real-world problems. Thank you for your strong leadership.